*All claims based on a critically sized canine proximal humerus defect model. It is unknown how results from the canine model compare with clinical results in humans. 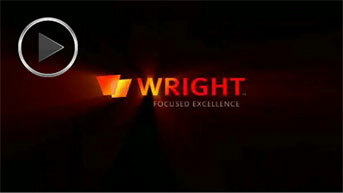 Data on file at Wright. PRO-DENSE™ Graft is a synthetic biomaterial. Combining calcium sulfate with calcium phosphate, has result​ed in a composite graft that is delivering where other materials may fall short. The accelerated rate of healing of the PRO-DENSE™ graft treated defects compared to those treated with autograft is principally evident by the higher density bone (i.e., 170% average increase in area fraction of new bone compared to autograft at 13 weeks) and superior average mechanical properties at 13 weeks. 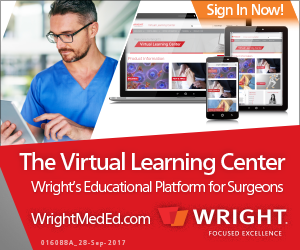 Histomorphometry reveals that the amount of newly regenerated bone of the PRO-DENSE™ injectable graft treated defects at 13 weeks demonstrated a statistically significant 170% average increase in new bone formation versus defects treated with autograft. PRO-DENSE™ injectable graft new bone area fraction is on average 170% denser than autograft at 13 weeks. 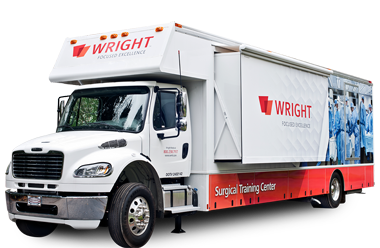 The newly regenerated bone in the PRO-DENSE™ injectable graft treated defects exhibited a 645% average increase in compressive strength at 13 weeks versus defects treated with autograft. *All claims are based on a critically sized canine proximal humerus defect model. It is unknown how results from the canine model compare with clinical results in humans. Continued dissolution of the primary 1st phase. In vivo, the body will have begun osteoclastic resorption of the brushite (2nd phase) and TCP (3rd and final phase). CaSO4 fully resorbed: The final phases of graft resorption will remove the remaining calcium phosphate. The body will remodel the regenerated bone to a more normal state over time. The following illustrations describe the basic steps in the process of new bone formation. 1. Angiogenesis is a key early event. The CaSO4 of the implant resorbs first, revealing a porous calcium phosphate scaffold conducive to vascular infiltration. 4. Growth factors in the implant/defect interface region, including BMPs, stimulate proliferation and differentiation of mesenchymal stem cells. 5. 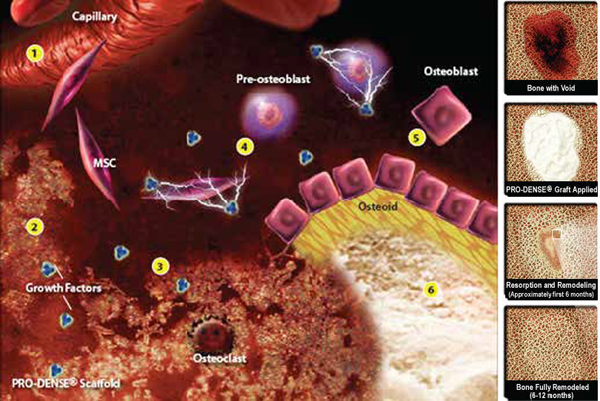 Differentiated osteoblasts lay down osteoid which then mineralizes to become newly woven bone. ​​†Growth factor binding based on in vitro data of BMP-2 and VEGF. Data on file. *All claims are based on a critically sized canine proximal humerus defect model. It is unknown how results from the canine model compare with clinical results in humans. Data on file at Wright. Histology at 13 weeks: The PRO-DENSE™ specimen (middle) demonstrated consistently denser and thicker trabeculae vs. autograft (left) and Cancellous Bone Matrix (right) at the same time point. Basic Fuchsin and Toluidine Blue, 75x. *All claims are based on a critically sized canine proximal humerus defect model. It is unknown how results from the canine model compare with clinical results in humans.STRONGER THAN NORMAL BONE*: At 13 weeks; Urban, et al… CORR, June 2007. FASTER THAN AUTOGRAFT*: The accelerated rate of healing of the PRO-DENSE™ graft treated defects compared to those treated with autograft is principally evident by the higher density bone (i.e., 170% average increase in area fraction of new bone compared to autograft at 13 weeks) and superior average mechanical properties at 13 weeks. DENSER THAN AUTOGRAFT*: Histomorphometry reveals that the amount of newly regenerated bone of the PRO-DENSE™ injectable graft treated defects at 13 weeks demonstrated a statistically significant 170% average increase in new bone formation versus defects treated with autograft. PRO-DENSE™ injectable graft new bone area fraction is on average 170% denser than autograft at 13 weeks. 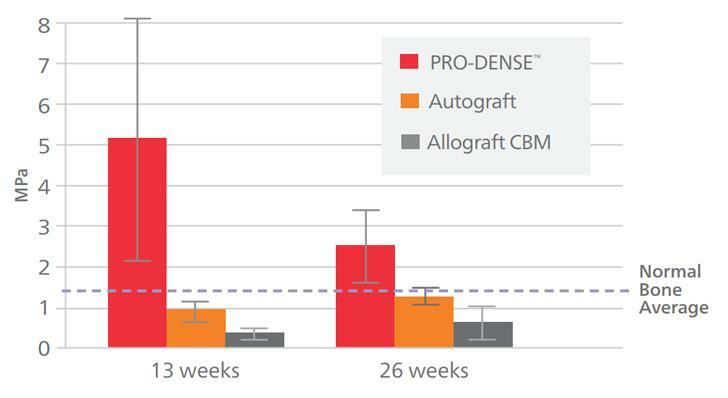 STRONGER THAN AUTOGRAFT*: The newly regenerated bone in the PRO-DENSE™ injectable graft treated defects exhibited a 645% average increase in compressive strength at 13 weeks versus defects treated with autograft. STRONGER THAN NORMAL BONE*: At 13 weeks; Urban, et al… CORR, June 2007. *All claims are based on a critically sized canine proximal humerus defect model. It is unknown how results from the canine model compare with clinical results in humans. Data on file. See package insert for indications, contraindications, and warnings. "PRO-DENSE™ Graft is providing the ideal process: dense, strong healing early coinciding with graft resorption, followed by remodeling to normal bone." 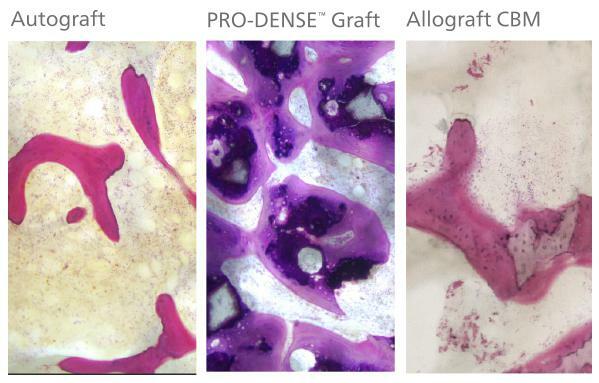 "PRO-DENSE™ Graft appears to be an excellent synthetic autograft substitute."